There were 2,053 separated minors in the government’s care as of June 20. The Trump administration says it has a "well-established" plan in place to reunite families separated as a result of the president's controversial zero-tolerance immigration policy, but there's still no word on when the reunifications would be complete. In a statement late Saturday night, the Department of Homeland Security said it was working "towards reuniting every minor and every parent" that had been separated due to the policy, which calls for criminal charges to be filed against anyone entering the country illegally. Children were taken from parents because children can't be sent to jail. There were 2,053 separated minors in the government's care as of June 20, according to the statement, which made no mention of a possible timeline for putting the families back together. DHS and Health and Human Services "have a process established to ensure that family members know the location of their children and have regular communication after separation to ensure that those adults who are subject to removal are reunited with their children for the purposes of removal," DHS said in the statement. "The United States government knows the location of all children in its custody and is working to reunite them with their families." "As part of the apprehension, detention and prosecution process, illegal aliens, adults and children, are initially detained by U.S. Customs and Border Protection" before children are sent to the Office of Refugee Resettlement and parents or older family members are sent to Immigration and Customs Enforcement custody, the statement added. "Each entity plays a role in reunification," the statement said. "This process is well coordinated." So far, 522 children have been reunited, and the reunions of 16 more scheduled for June 22 were delayed at the time because of weather. Donald Trump last week signed an executive order to end the practice of separating families at border crossings amid criticism from lawmakers on both sides of the aisle, although he previously claimed that only Congress could fix the problem. 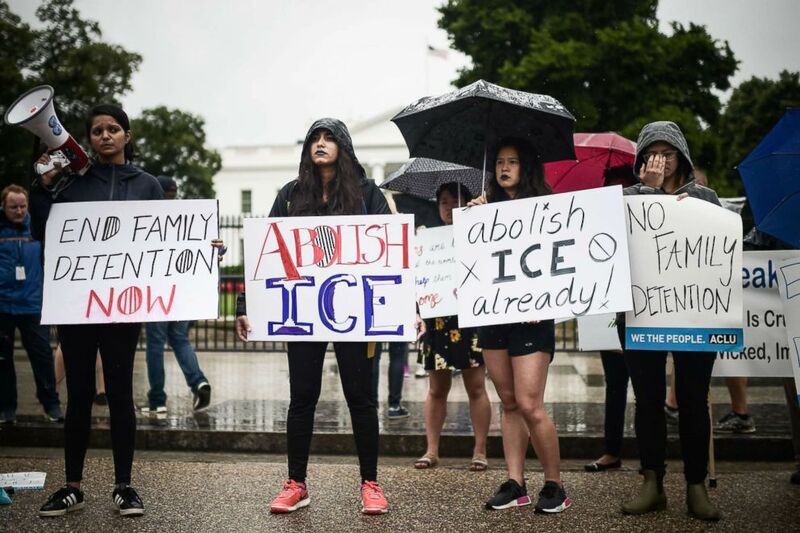 (Eric Baradat/AFP/Getty Images, FILE) Activists gather outside the White House in response to a call from the American Civil Liberties Union (ACLU) to protest the separation of children from their migrant families at the US-Mexico border, June 22, 2018, in Washington, DC. Trump said his zero-tolerance policy will remain in place despite the executive order. "We cannot allow all of these people to invade our country. When somebody comes in, we must immediately, with no judges or court cases, bring them back from where they came," Trump said in a tweet on Sunday. "Our system is a mockery to good immigration policy and Law and Order. Most children come without parents." "Our Immigration policy, laughed at all over the world, is very unfair to all of those people who have gone through the system legally and are waiting on line for years! Immigration must be based on merit," he added. Critics, including top lawmakers on both sides of the aisle, have called for an immediate end to the practice, with some calling it inhumane and cruel. Senate Democrats sent a letter to Judiciary Chairman Chuck Grassley last week calling on him to hold a hearing on the policy. "We cannot remain silent in the face of these horrifying stories," the letter read. "We respectfully request an immediate oversight hearing to better understand the scope, nature, and impact of the Trump administration’s new 'zero-tolerance' policy on children and families."